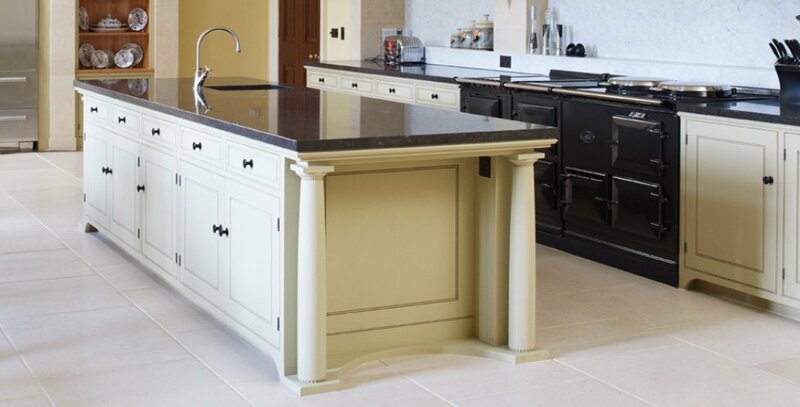 Artichoke has designed bespoke kitchens into many country homes in Berkshire over the last 25 years. Close proximity to London means Berkshire has always been a great location for some amazing country houses with a great variety of architectural styles. The variety of architecture in Berkshire tends to be more varied than that found in neighboring counties, with great houses including Welford Park (a beautiful Queen Anne house near Newbury), Basildon Park (a magnificent Georgian house near Pangbourne), the incredible Victorian Highclere Castle and Dorney Court, a Tudor mansion near Windsor being great examples. Artichoke has a particular love and interest in elegant, timeless and traditional kitchen and joinery design, and our perfect Berkshire project is one where where our design and our client’s architecture work seamlessly. Being completely bespoke gives Artichoke’s design team tremendous flexibility, and we are able to design in any style and use any material and finish. We are not limited by set styles and ranges, and this freedom allows us to take a unique approach to designing kitchens for Berkshire clients. It allows us to carefully consider the architecture and to design in a way that compliments it. It allows us to use any materials, such as stones from Berkshire quarries. And it allows us to take a focused approach to period detail, allowing us to design traditionally made kitchens that look as if they belong with the space that they’ve been designed for. Artichoke was recently asked to design a bespoke kitchen for an Edwardian house near Newbury. 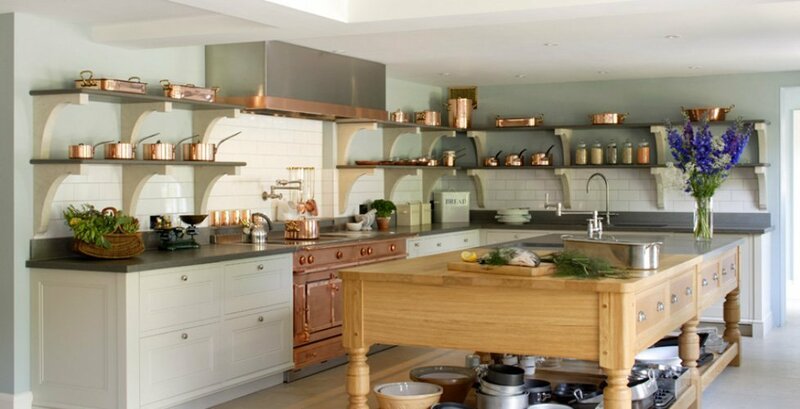 The kitchen was to include a custom copper and stainless steel range cooker from La Cornue which we designed to be built specifically to match the client’s own copper pans. A large cook’s table inspired kitchen island for a professional cook and restaurateur. Low ceiling heights discounted tall cabinets, so the design team designed open shelves to display the client’s copper pots. The shelves were made from black basalt resting on limestone brackets, which we repeated for the bench seats on the opposite site of the room between floor to ceiling glazed cabinets. The open cook’s table kitchen island was made from oak, with plumbing fixtures being run through the centre of the turned legs. The worktop is part basalt and part oak. Since this project we have designed a grand kitchen for a Georgian house near Ascot and a period library and dressing rooms for a house near Bray. We are also currently designing the principle kitchen for a newbuild project near Ramsbury. If you’d like to discuss your project in Berkshire, please get in touch with us on 01934 745281. You can view our portfolio to see more examples of our work or contact us to discuss your project in more detail.